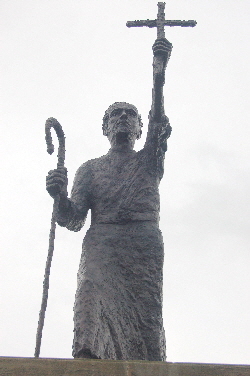 Saint Mirin, an Irish Monk ( circa 565 died circa 620), is the patron saint of Paisley. His feast is celebrated on the 15th September. He founded the first Church in Paisley, thought to be at Seedhill and after his death the shrine of Saint Mirin became a centre of pilgrimage. Within Paisley Abbey there is a Chapel dedicated to Mirin containing a sculptured stone frieze depicting the life of the saint. A sandstone pedestal bearing the inscription At Length Full of Sanctity and Miracles, Mirin Slept in the Lord at Paisley was erected in 2003 opposite St Mirin's Cathedral and a bronze statue of the saint by Norman Galbraith was mounted on the pedestal with a formal unveiling on the saint's feast day, Saturday September 15th 2007. 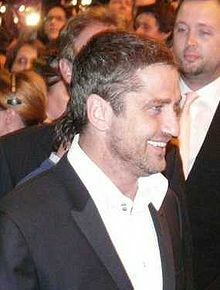 Gerard Butler was born in Paisley on 13th November 1969. He has appeared on film, stage and television. A trained lawyer, Butler turned to acting in the mid-1990s with small roles in productions such as the James Bond film Tomorrow Never Dies which he followed with steady work on television. In 2007 he gained worldwide recognition through his portrayal of King Leonidas in the film 300. Since then, he has appeared in projects including Nim's Island , RocknRolla , The Ugly Truth , Gamer , Law Abiding Citizen and The Bounty Hunter .